I’ve been waiting until I was truly convinced the weather really had started to warm up to start considering my spring wardrobe There’s nothing quite like the disappointment of spring’s arrival followed by April showers to dampen your spirits, is there? Although I doubt we’ve seen the last of the rain, I’m eager to welcome spring into my home and my wardrobe. It’s time to swap out heavy coats and chunky knitwear for something a little lighter. Despite having an all-seasons wardrobe that I wear no matter the season, I like to remind myself of my favourites and discover new ways to wear them for the changing weather. Every season I spend an hour or so on a wardrobe audit; going through my clothes and picking out my favourite weather-appropriate pieces. It helps me to take stock of what I own and ensures I’ve got everything I need to get through the coming months comfortably. I take note of anything that needs to be repaired or replaced, and identify potential purchases to go on the shopping list–if anything. Over the years and through the seasons, I’ve found my style slowly shifts and changes. Even though I’ve owned much of my wardrobe for years, I pick up new pieces here and there–as we all do–mostly second-hand and therefore out of season. 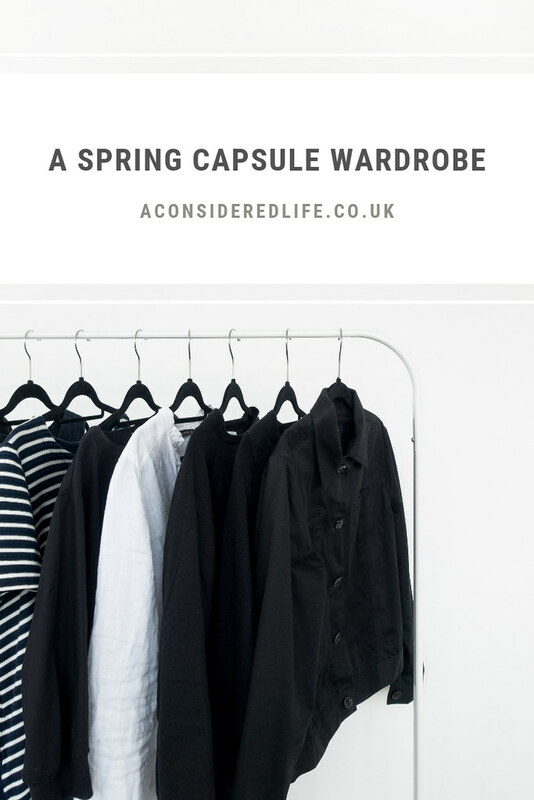 Going through and creating a foundational capsule is a good way to familiarise ourselves with the items we own to discover fresh ways we can style. It never fails to get me excited about the change in weather. I like to put together a capsule compromised of the pieces I imagine myself wearing most frequently throughout the following weeks. I’ll no doubt reach for other items over the season but the pieces I’ve pulled together to create a capsule are the ones I’ll wear over and over. My spring capsule last year was a bit limiting and had more neutrals; this year I've honed in on versatility and comfort. Cotton Top by MUJI. This one is similar although mine is fitted at the wrists. I enjoy wearing loose layered clothing and this top is perfect for that. Linen Shirt by Zara (second-hand). A great thrift find, this shirt is chic without the effort. Paired with the culottes and skirt is looks dressy and worn under a sleeveless dress it's more casual. Cotton Shirt by Uniqlo (second-hand). A simple classic shirt that's easy to wear. It's a couple of sizes too big so I like to leave the top buttons undone and tie it at the front to make it look less casual and more chic. Cardigan by Boden (second-hand). Bulky knitwear can ruin an outfit and I struggle to find cardigans that are the right length. This little cardigan is so perfect; it has a cropped style so it hits me in exactly the right spot, and buttoned up it looks classically smart. Linen Skirt by Tricotage. I hunted forever to find the perfect skirt and I found it! Unfortunately Tricotage has stopped making this one and I've yet to find another that comes close. It's made of linen so it's lovely and light with a paper bag waistband that cinches you in. Jumper by Know The Origin (gifted). It's good to have the option of a warm jumper in case the weather turns chilly. This is 100% cotton with a fleece-like interior to keep you warm while the boxy fit and cropped sleeves make it a more spring appropriate piece. Culottes by MUJI, these are similar. Smart, comfortable, versatile; I love these wide leg trousers a lot. Paired with boxy tops it gives that layered style I love and worn with shirts tucked in or tied at the front creates an effortlessly chic appearance. Striped Dress by Uniqlo (second-hand). Stripes are a classic for spring and this is such an easy-to-wear dress that it was the first thing I reached for when creating my capsule. It's an all-in-one outfit; just throw on some shoes and I'm ready to go. Sleeveless Linen Dress by MUJI. This piece is so versatile, I wear it all through the year. The loose fit and sleeveless cut means I can wear shirts under or over the top creating completely different looks plus it's made of linen so it's extremely lightweight and cool to wear. Jacket by Farnol (gifted). Obviously I'm going to keep reaching for the more protective coats in my wardrobe when the weather isn't pleasant but for those perfectly sunny spring days, this utility jacket is ideal. It's a denim jacket for people who don't like denim (hi, that's me) with a cropped boxy fit useful for layering. Sandals by Birkenstock. I purchased mine a few years ago from Vegetarian Shoes and they're still going strong. These sandals are so comfortable, I never take them off my feet when the weather is warm. Mules by Matt and Nat. Mine have sold out, these are similar. Smart, comfortable, and perfect for spring evenings, these are the shoes I wear when I've got plans and want to look extra smart. Espadrilles by TOMS (gifted). When I need shoes that aren't overly dressy nor too casual, I reach for these canvas slip-ons. I can throw these on to run errands but I'd also be comfortable wearing them to lunch with friends. Handbag by Matt and Nat. Compact and neat, this little handbag can hold all my daily essentials without ruining my outfit. I keep my Kanken Mini to hand if I need more space. Jewellery by Oh My Clumsy Heart. In winter I don't tend to wear as much jewellery because it gets hidden under layers of knitwear so when spring rolls around I'm ready to add it back into my wardrobe. Minimal jewellery is the style I always opt for, of course. What's in your spring capsule?